We like to visit Hawkshead around this time of year and have always stayed at the Croft, which is just across the road from the village. Not this time, though, it was closed. It looks like they are trying to squeeze a few more statics in and are re-landscaping the touring pitches. They helpfully recommended their sister site, Hawkshead Hall, instead. It's about half a mile outside the village, a short walk along a good footpath beside a stream. What a great site, at this time of year at least (reviews aren't so good in high season). Excellent facilities, well spaced pitches and great views, we will probably come here in future instead of the Croft and can't really think of anything bad to say about it. The road from from Ambleside is narrow in places and not much fun to drive along with a caravan, but luckily we didn't meet any buses or lorries coming the other way and we arrived early afternoon. We had plenty of pitches to choose from and chose one away from the road and the farm buildings (it's a working farm). There was only one other caravan on site but quite a few small motorhomes. The hill in the distance is Latterbarrow. 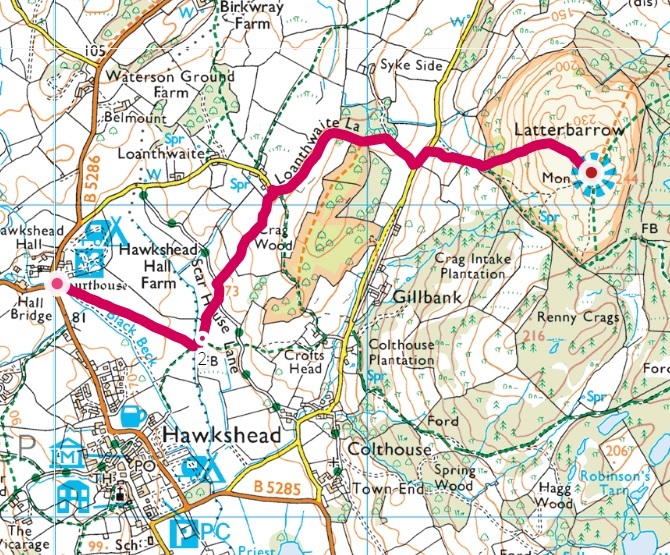 After setting everything up we walked into Hawkshead, which took less than 10 minutes. Hawkshead is a nice village with a few shops and four nice pubs. We had drinks in the Kings Arms, our favourite, but didn't stay out late, instead retreating to the caravan for dinner and a night in. 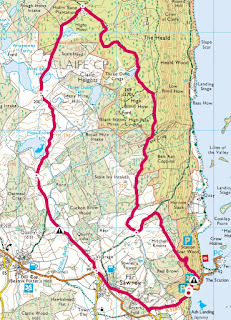 Fabulous weather for November, so we went for a walk from the site to Latterbarrow. Great views of Ambleside and Windermere from the top but the pics didn't turn out too well, so not many here. D struggling to get to grips with the new camera. Picture quality is great but composition is lacking lately! In the afternoon we sat outside the caravan for a couple of hours, enjoying the peace and quiet, then walked to nearby Esthwaite water as it started to get dark. It would be nice to be able to walk around it but it's mostly private land, so no footpath. We stopped off in Hawkshead afterwards and had a drink in the Sun Inn, then went back to the caravan for dinner and another night in. A very cheap trip so far! 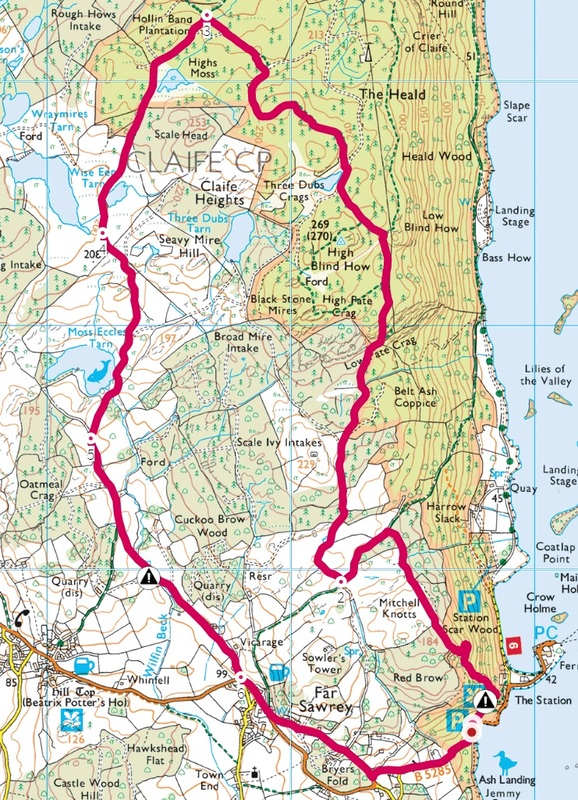 Another great day weather-wise, so we went for a longer walk in the hills around Faw Sawrey. First stop was Claife viewing station. Good views, but not that good! Then Wise Een and Moss Eccles tarns. We stopped off at the Cuckoo Brow Inn on the way back to the car and thought we would drive back later for dinner. 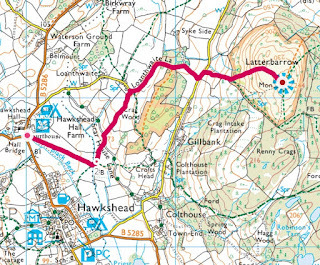 We did drive back in the evening but couldn't get in the car park, so we quickly abandoned that idea and walked into Hawkshead instead. We had roast dinners in the the Sun Inn, then relocated to the Kings Arms for the rest of the evening. The other pub we like, the Red Lion, was closed. We missed it all during the day, but it seems it was Mitzvah day in Hawkshead, and a group of people involved in it came in to the pub and started playing a fiddle and accordian. Well, we had to stay and watch, and we ended staying out until about 10pm and drinking more that we should have. So much for a cheap trip. A good night, though. A very uneventful journey home, hill start assist making light work of the feared hill start at Clappersgate! A great trip, one of the best of the year. One more trip before Christmas, we think, but probably somewhere more local. Southport, maybe.